Every morning I wake up at 7 AM and drink a cup of black coffee. I sit in my recliner with my feet up and watch the birds play in my red gourd birdhouse as the sun rises behind them. I tap dance to my chair each morning with excitement wondering what my little bird friends are up to today. Some days they are out and about for their morning stroll; other times they are snuggled up together in the house taking an extra hour or two of sleep. If I’m lucky, I get to see mama bird feeding baby birds their breakfast. If you enjoy birdwatching from the comfort of your own home, keep reading, because in this article we will talk about how make a beautiful gourd birdhouse and turn your home into a bird paradise. Before you buy or start making your own gourd birdhouse, it’s important to decide what species of bird you would like to attract. Different species of birds have different preferences for their homes. They all have a specific preference for gourd size, hole size, and height for the house to be from the ground. For example, purple martins prefer a crescent shaped hole in a 9” diameter gourd and they like the house anywhere from 12 to 20 feet from the ground. Bluebirds like a gourd 6-8” in diameter with a 1.5” hole that is hung 5-10 feet from the ground. Wrens prefer a gourd that is 6-8” in diameter with a 1.25” hole hung between 6 and 10 feet from the ground. 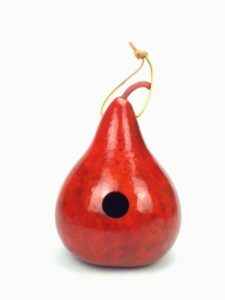 We have our own birdhouse hole size chart which shows the gourd specifications for each different bird type, so be sure to take a look at this before making or buying your own. What Type of Gourd is Best for Gourd Birdhouses? 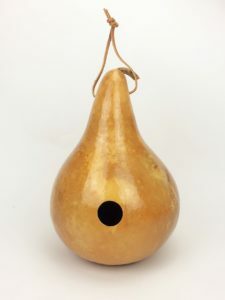 There are several different types of gourds that make great birdhouses. 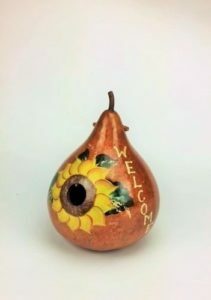 It is generally known as a birdhouse gourd, but there are specific types that you can choose from. 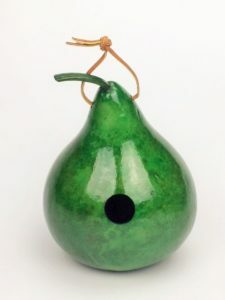 The most popular type of birdhouse gourd is the kettle gourd, also known as the martin gourd or the purple martin gourd. 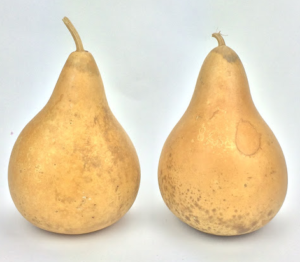 These gourds are pear shaped and range anywhere from 6” in diameter all the way up to 12” in diameter. 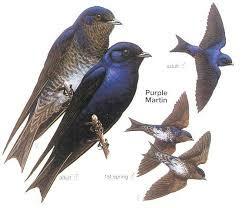 For larger birds like the purple martin, they prefer a 9-10” kettle gourd. For wrens, chickadees, and most other small birds, a kettle gourd from 6-8” in diameter works best. Dipper gourds and bottle gourds also make great birdhouses. For these, just use the same diameter measurements as the kettle gourds. Where do I Find These Gourds? To grow these gourds you will need to have good weather where you live. Cold climates are very hard to grow gourds in because they need lots of sunshine to grow as well as good dry days after the growing season to dry out and be ready for crafting. Gourds can really take up a lot of space when growing. Not only can the gourds themselves get quite big, but the vines they grow on can grow 20, 30, even 50 feet long! Imagine planting a few seeds in a small garden in your backyard and before you know it the vine is knocking on your door! Of course, fertile soil is best for anything, including gourds. Some yards are rocky, full of clay, or just barren with very little nutrients in them for something like a gourd to grow in. Before planting, make sure your yard has good soil so they can grow into nice, healthy, thick shelled gourds. While gourds can technically grow anywhere, they really do best in areas with warm weather. It will take anywhere from 5-7 months from time of planting to having a fully grown gourd. The final step is drying. This process can be sped up by using fans or other appliances, but the best way to do it in my experience is a combination of sunlight and patience. 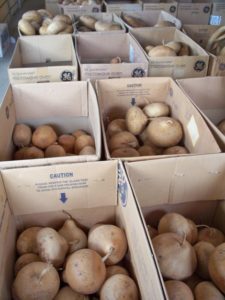 We have articles on growing gourds, harvesting gourds, drying gourds, and cleaning gourds here on our website if you’d like to do learn more about growing them yourself. Another option is to buy them directly from a farmer. Here at Amish Gourds we have kettle gourds and dipper gourds that are dried, cleaned, and ready to be made into a beautiful homemade birdhouse. We also sell unfinished birdhouses ready to be painted as well as fully finished birdhouses. Before any crafting begins, we have to make sure the gourd is clean. There are many different ways to do this; one simple way is using a steel wool pad, warm water, and dish soap. You simply let the gourd soak for about an hour, scrub it with the steel wool and dish detergent/water mix and then let it dry again. When cleaning your gourds, it is very important to stay safe. Please read our gourd cleaning safety tips to make sure you protect yourself from irritants, mold, fumes, dust, and everything else that can come with cleaning your gourds. For this step you will need a drill, a ¼” drill bit, a 3/8” drill bit, and a hole saw. A hole saw is a drill bit with serrated edges in the shape of a circle – we will use this to drill the entrance hole. Make sure the hole saw diameter is the size that corresponds with your favorite species – remember from the beginning of the article that certain birds prefer certain entrance hole sizes. Position the hole saw slightly above the center of the gourd and drill until the hole is formed. 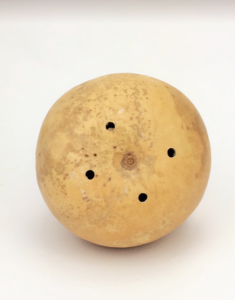 Then switch to the 3/8” drill bit and drill 4 holes in the bottom of the gourd for ventilation and drainage. Finally, we will make the holes used to hold the hanging strap. Drill 2 holes opposite of each other at the top of the gourd using the ¼” drill bit. You can feed coat hanger through the holes and twist the tap for an easy hanging strap or you can use rawhide or leather to give it a more natural look. Now comes the fun part: adding some color. The two most popular ways to do this are by dying and painting. The simplest finish is spraying a few coats of clear polyurethane spray (as pictured above). This is clear and gives it a nice, natural finish that shows all of the colors and textures of the gourd itself. The best brand for this is Helmsman – is come in a green spray bottle and has a picture of a door on it. It provides great UV protection which prevents the sun from causing any damage. Staining them is another method. Using this method gives an absolutely beautiful finish. It adds color to the gourd and still shows the natural textures and colors underneath. The best way to do this is using something called leather dye. You apply it with a brush or a wool applicator pad. Green (pictured above with green stain), red, and shades of tan make an excellent finish. After applying the dye, apply a few layers of poly-spray like the step above to protect it. Painting is another way to add some color. The birdhouse pictured above is painted with a sunflower design and then covered with a few coats of polyurethane spray. After safely sanding the gourd, add a first layer of oil based primer followed by a few coats of enamel paint. It’s a lot of fun to paint landscapes, animals, and designs, too. 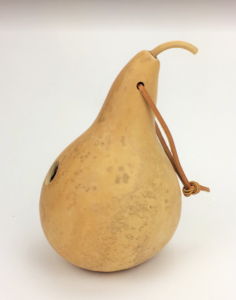 Of course, if all of this seems like a little too much work, you can always pick up some of the gourd birdhouses available on our website. This way you can enjoy all of the fun of birdwatching without all of the hassle. So there you have it, that’s how to create a gourd birdhouse, from planting the gourd to painting it. Try hanging up a few birdhouses and before you know it you will be welcoming in some new bird friends!